The Official Blog of Hire Plus Limited. Plant and Tool Hire, Fullbridge, Maldon, Essex, England. | Life in the fastlane at Hire Plus Limited, Fullbridge, Maldon, Essex. Hire Plus Limited is bassed at the Full Bridge, Maldon Essex servicing all around the country of Essex with Plant and Tool Hire below is just some information about the County we work in. The reason for this overview is at times we take what’s around as for granted. Chelmsford, as well as Colchester and Maldon. The name Essex comes from the old English Ēastseaxe (i.e. the “East Saxons”). Colchester – in the northeast of the county – is the oldest recorded town in Britain. The county is one of geographical extremes with heavy industrial landscapes, the ancient woodland of Epping Forest and 350 miles of coastline (making it the longest of any English county). It is also known as Constable Country because of the undulating rural landscapes made famous by the painter John Constable. Mid Essex has much to offer with Colchester, Chelmsford, Witham, Maldon, Tiptree and Burnham on Crouch proving especially with visitors to the region. Colchester has a rich heritage and history including the largest Norman castle keep in Europe. Today it is also a modern, vibrant town with shops, restaurant and family attractions such as the zoo. It also offers walking and cycling art trails across the region. Chelmsford is known as the birthplace of the radio with the first radio broadcast being made in 1920. Marconi – the radio pioneer – opened his factory in Chelmsford and the company (in some form) still exists in the town. Witham is a picturesque Georgian town at the very heart of Essex. Visitors can enjoy picturesque town walks and visit Whetmead Nature Reserve. The town was also home to celebrated writer Dorothy L. Sayers from 1929 to 1957. Maldon is a great example of maritime Essex. Along with nearby Mersea Island, Maldon has been described as the ‘new Brittany’ and is celebrated for its fresh seafood. The area is a popular venue for leisure sailing and there are numerous marinas throughout the area. Tiptree is famous for its prize winning strawberry jam, a local favourite and praised by James Bond in ‘From Russia with Love’. The ‘Little Scarlet’ strawberry is the perfect strawberry for jam making and Tiptree is one of the few places worldwide where the variant is grown. Roger from Hire Plus Limited. Maldon Essex. 10,000 square metre development on the Blackwater Trading Estate. such as B&Q, Homebase and Halfords have all shown an interest as well as hotel chain Travelodge. A planning application for a new £20 million retail park to include a major store, restaurant and hotel was rejected even though it would have generated up to 160 permanent jobs, Aquila plans also included to build a new access route on the nearby roundabout which serves The Causeway and the A414, one of the main gateways into the town and just off the Fullbridge where HirePlus are based. As a local plant hire business, I have mixed views but I can’t help feeling deep down that anything attracting significantly more visitors to Maldon would benefit the town hugely, I hear weekly from visitors that they love the independent shops in the High Street, Maldon, so I can’t see how a Retail Park would change this. Let us know your thoughts Yes or No to New Retail Park in Maldon. Hire Plus Limited from The FullBridge, Maldon, Essex were once again happy to be one of the sponsor of this year’s re-arranged Maldon Mud Race. Suppling hire equipment to the organisers with aluminium access towers, scaffold and ladders as required. The Event was postponed from the New Year due to extreme cold weather, this dash across the Blackwater estuary is an annual and what an event this was. A record 12,000 people lined the sea wall in Promenade Park for the unusual sporting event on Easter Monday. 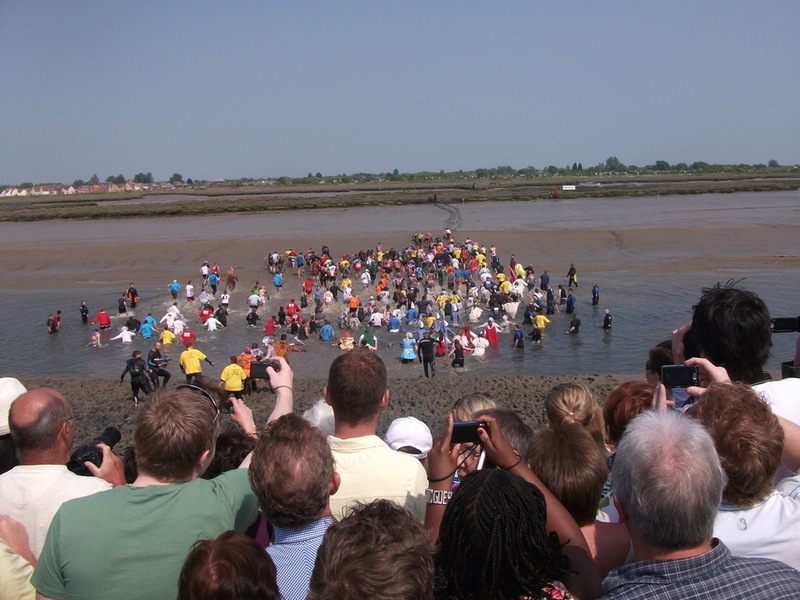 Now organisers of the Maldon Mud Race have said they would consider the possibility of moving the event to the Easter weekend on a permanent basis. The race, which saw more than 250 people run across the River Blackwater, is usually held over Christmas. Brian Farrington from the Rotary Club of Maldon said the 2011 running had been a “highly successful event”. “It was one of the best ones we’ve ever had, certainly the weather was on our side and to have some celebrities along as well made it a fantastic event,” he said. The 500-yard (457m) race was originally due to be held on 28 December, but was postponed due to the extreme cold weather at the time. Mr Farrington explained any moving of the race from its traditional winter date would need to be discussed. “We’ll have to review the whole event with Maldon District Council with whose property we share on the day and also talk to the police as well,” he said. Hire Plus Limited Number One in Maldon Essex for Tool Hire. 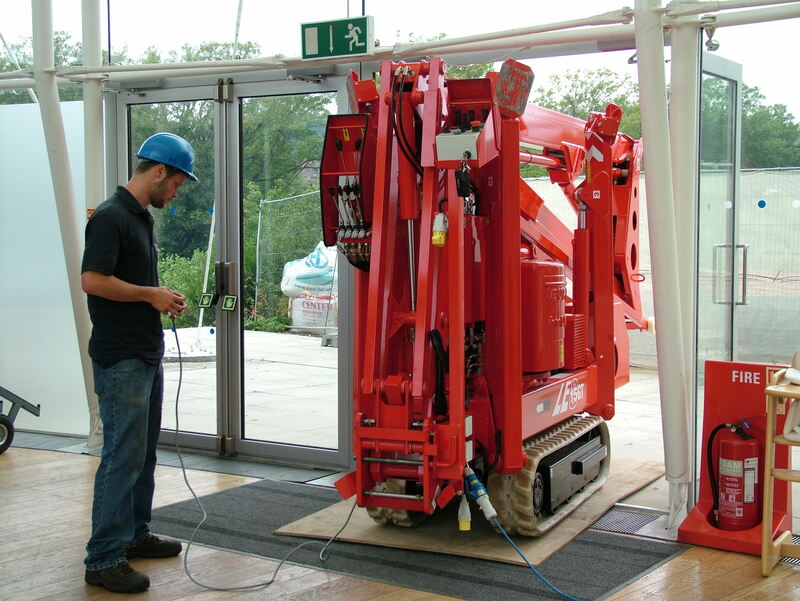 Working inside or out our expertise with powered access equipment ensures that we supply you with the right equipment. Cherry Picker, Boom Lift, Man Lift, Basket Crane and Hoisting Equipment are all names that are used for aerial work platforms make sure you put safty first working inside or out. Remember a fall from a stepladder did in 2008 put a man in a coma for two months and the results were a hefty fine for the employer, keep on the right side of the The HSE before it’s to late. What a different Tuesday for us all around The Fullbridge, Maldon, Essex area. Once again and not for the first time this year Maldon was again put on the TV map with yet another fire, roads were closed off, businesses evacuated and emergency rest centres set up following the major blaze in Maldon. It broke out at Sill-Die in Fullbridge Quay shortly before 1pm just over the road from us however matters escalated when the fire exploded two chemical tanks. Witnesses reported seeing a bright white flash and hearing a huge bang as the phosphorus tanks caught alight. Forty firefighters were called in to tackle the blaze but were hampered by the presence of magnesium, which has a violent reaction to water. Police sealed off the area from Station Road to Market Hill and evacuated nearby businesses, including the Tesco superstore and fuel station. Until the next time, Roger.